Due to a very busy schedule, I have done my research and found a company that best fits my criteria to offer high quality prints at affordable prices to my clients. Fine Art America has proven to be a valuable tool for me to offer my artwork while not having to deal with shipping or customer service, as they do everything for me. You won’t be disappointed with the quality, they do a phenomenal job and offer all different sizes and mediums to be suit your needs. If you have a spot that is a specific size, you can match it up perfectly with the different options available. This entry was posted in Uncategorized and tagged art, artwork, brook, drawing, fishing, grayling, laferriere, nick, print, rainbow, salmon, trout on August 16, 2013 by nicklaferriere. A few years ago I got the chance to fish up on arguably one of the best natural fisheries for brook trout in the world, God’s River, Manitoba. A big, turbid river, the God’s is home to some very impressive brookies. Unlike the cute stream brookies, these brutes get big! Our first day on the river we spotted a pod of four fish right across from the lodge that were pushing 30″ and were in the 10lb class range. Before heading up I had no real experience fishing for brook trout and relied on articles I had read about how to fish for them. I brought all streamers. However, this proved to be a rookie mistake as we were fishing late July and the fish didn’t want anything big. Knowing what I know now, I would have brought a selection of nymphs and dries. The experience, although not overly successful fishing wise, was nothing short of amazing and we witnessed some of the largest brook trout in the world in their natural setting. This drawing I did after my trip to God’s River, depicting a brightly coloured male. A fully coloured male brook trout is arguably one of the most beautiful freshwater fish we have. 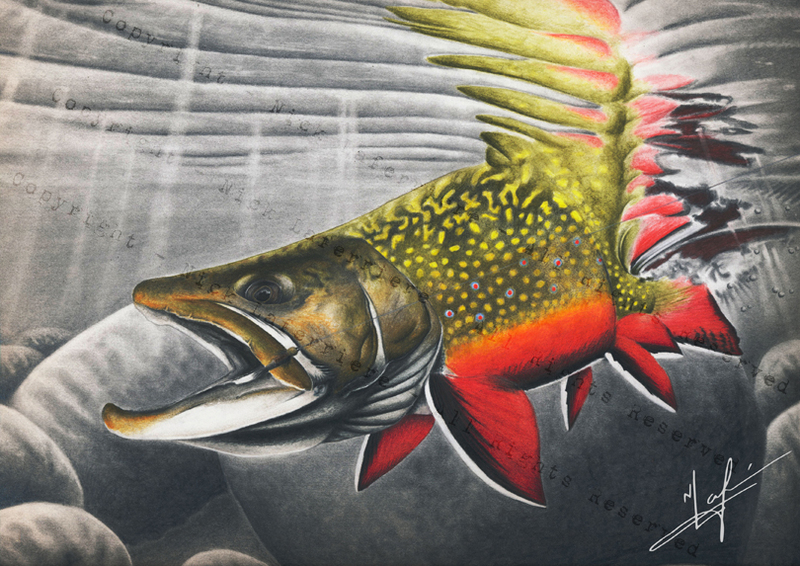 This entry was posted in Fine Art and tagged art, artwork, brook, drawing, fontinalis, laferriere, nick, nick laferriere, painting, salvelinus, speck, speckled, trout on April 24, 2013 by nicklaferriere.